basis of online test and interview. Depends upon number of vacancies only higher marks secured candidates are only called for interview. Online form submission last date is 30-04-2019. Official website to apply online is http://www.kvb.co.in/. 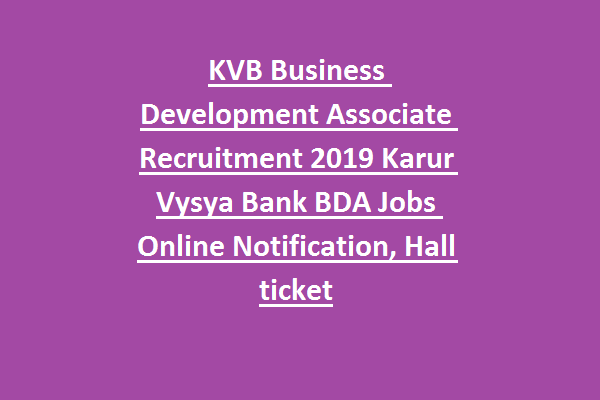 Age limits, qualifications, selection process and other details are given below for this Karur Vysya Bank Business Development Recruitment 2019 is updated below. Total vacancies are not at updated by KVB. Degree qualified candidates are eligible for this KVB BDA jobs. Minimum qualification for this BDA posts is 50%. Job profile is Sales and marketing of bank products. Age limits are 21-28 years for this KVB Business Development Associate posts. Age limit cut off date is 28-02-2019. For BDA posts monthly salary is Rs.18000/- + Performance Based allowances. For KVB BDA posts written exam will be held in 2 stages. 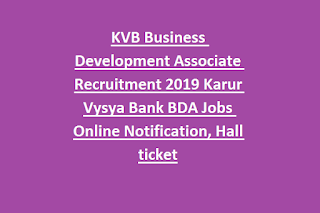 Apply online for this KVB BDA jobs through official website of www.KVB.co.in. Closing date of online form is 30-04-2019.